‘Stripe’ is a simple 2-level menu plugin for WordPress, designed to add a little life to your site’s header or footer. Once activated, the menu will scroll along with the page so it would be visible at all times, making it a great place to insert important links to. Alternatively, the menu can also be placed in an absolute position so it will scroll off the screen with your other content. ‘Stripe’ does not replace or affect your theme’s current menu(s). Instead, it is an effective addition that can be used to highlight certain posts or pages on your site, house your social links, or even serve as a location to place e-mail and/or phone call buttons to. With a huge amount of icons to choose from, its uses are many. 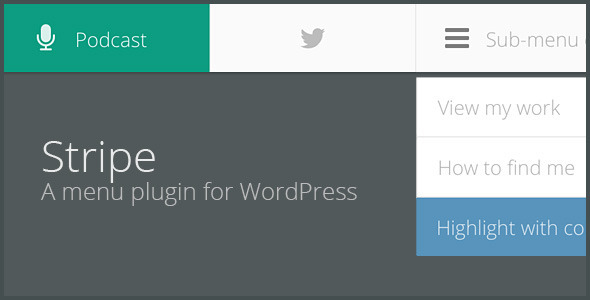 Using the built-in WordPress customization tools, customize all colors to anything you’d like. 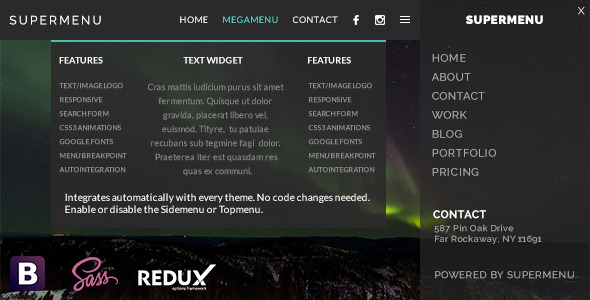 This entry was posted in Interface Elements, Menus and tagged css menu, css3, fixed menu, menu, menu plugin, menubar, navigation menu, plugin, sticky menu, wordpress, wordpress css menu, wordpress menu, wordpress menu plugin, wp menu, wp menu plugin on August 4, 2015 by Vera Jaman.